Hey, who wants to stay overnight at the camp where they filmed Friday The 13th? It’s the human condition: Rich or poor, healthy or unwell, one of these days, we’re all going to die, probably because a serial killer hid under a bed somewhere and then jammed an arrow through our throats. (Statistically, it’s America’s third-most common form of arrow-based death, right behind Hunger Games reenactments and clumsy fletcher-based accidents.) So, hey: Why not take a few risks in this life? Buy a lottery ticket. Eat that weird sushi. Go camping at the place where a grief-stricken Pamela Voorhees brutally slaughtered all those dumb camp counselors 38 years ago. That’s the offer being made by Camp No-Be-Bo-Sco, the still-operative Boy Scouts camp that once served as the shooting location for Sean S. Cunningham’s slasher mega-hit Friday The 13th. 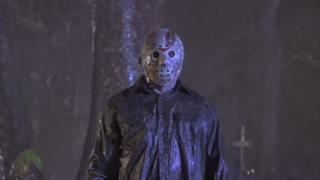 According to Bloody Disgusting, the normally closed-to-the-public camp has a mildly accepting relationship with its place in film history—opening for tours periodically, usually on a Friday the 13th—but has never allowed horror fans to actually camp out and really bask in the feeling of being pitchforked to death by a guy in a hockey mask. (Because, again: Actual working Boy Scout camp.) That’s about to change, though, because the camp is offering a chance for the cash-heavy slasher fan to actually camp at “Camp Crystal Lake,” complete with an appearance from original Final Girl Adrienne King.